The biggest news at Macworld Expo is hardware-related, but there are a few significant software developments. Macworld has pulled together story links for the biggest stories in Expo thus far. Does This Mean We'll Have to Redecorate? Hoping to revitalize slumping iMac sales, Apple dropped the price of its entry-level iMac to $800 and introduced a whole new color palette. Entry-level iMacs will be available only in Indigo; the rest of the iMac models are available in a variety of new colors like Ruby, Sage and Snow. To see what color corresponds with what computer feature, read the table in Jason Snell's Macworld story. In addition to the new iMacs, Apple also announced price adjustments for G4 towers - and debuted a multiprocessor G4. MacWeek's David Read discusses the new G4 offerings - which include Gigabit Ethernet on the motherboard - and how applications may or may not be optimized for the new machines; Jason Snell offers a feature-by-feature explanation of what's in the new Macs, and provides a chart for comparing the different G4 towers. The most dramatic - and well-received - hardware announcement Apple made was their introduction of the Power Mac G4 cube. Measured at a petite 9.7 inches tall, the G4 cube packs a punch in a consumer-friendly package. 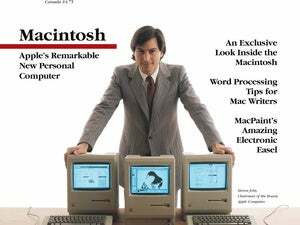 Macworld called it "the computer of the future". MacWeek contributor Dori Smith asks, "who's the market?" for the new machine. The shape of the computer brought back memories for many Apple history buffs: MacWeek contributor Andrew Shalat points out that Steve Jobs has introduced cube-shaped computers before. Apple didn't restrict its design surprises to CPUs: in addition to the new machines, Jobs also introduced three new displays, an expanded keyboard and a new optical mouse. Joking that "we have many flaws, but we do listen," Jobs said the mouse was developed in response to user complaints about the tiny, puck-like mouse that shipped with Apple desktops. Users shouldn't have too much to complain about now: the keyboard and mouse will be included with every desktop Mac, and are available to USB-equipped Mac owners via the Apple store for $59 each. Although the Mac has strong market presences in the creative professional and education markets, it's not synonymous with small-office types. MYOB, the developers of Accounting Plus bookkeeping software, are aiming to fix that with their forthcoming AccountEdge. MYOB wasn't the only software maker targeting business-minded Mac users; Microsoft announced their new Office 2001 software package. The software includes enhanced drop-and-drag capabilities between applications, QuickTime support and an expanded clipboard that lets Office users cut and paste multiple items. MacWeek editor Stephen Beale has the rundown on what the new software package can do. Jon Seff examines the G4 Cubes's audio capabilities. The cube ships with a pair of sleek Harman Kardon speakers; how it will sound is important to hard-core audiophiles. David Leishman points out a potential frustration for many multimedia types: the G4 cube is difficult to upgrade. In other, better news for the sight-and-sound crowd, Apple is releasing iMovie 2, and bundling it free on its new Macs. Folks who already have iMovie - or want to buy the new version - will be able to do so from Apple's website later this year.